Recently I got a chance to check out Catholic Gifts after receiving this BEAUTIFUL Walnut Crucifix. I fell in love with all the details and beauty of the product and especially the high quality! They carry a large assortment of items for all occasions from Baptisms to Christmas!! They also carry engrave Catholic gifts such as Patron Saint Medals. Need a gift for a loved for First Communions or for Mother’s day? They have a great coupon for $5 of orders over 40.00 and $10.00 off orders over 60.00. So make sure and stop by to check them out! But here’s the best part! 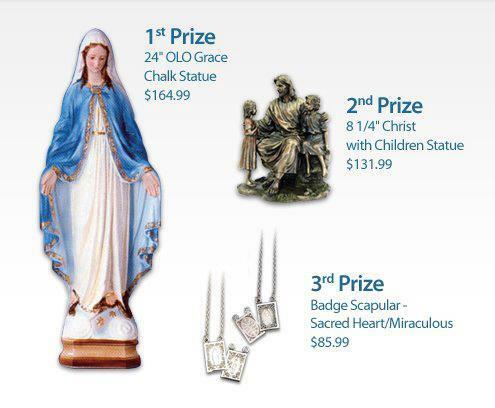 Discount Catholic Products is having a great giveaway on their facebook page from now until April 15! Stop by and enter to win one of these great prizes!! Make sure and like their facebook page!Let them know Conservamom sent you! Thanks for the giveaway tip! We’d love to win one of the statues!